Wilde Analysis helped Forum Energy Technologies evaluate the pressure drop through an existing manifold design using ANSYS Fluent. The pressure drop data was then used with the Fluent Adjoint Solver to automatically optimise the design of a new manifold for a subsea trencher. This resulted in a significant reduction in the loss coefficient associated with the system. Wilde Analysis helped Forum Energy Technologies (FET) optimise the design and performance of the forward tooling assembly on their new subsea trenching vehicle using a combination of ANSYS Fluid Dynamics and Structural Mechanics simulation software. Through the successful application of FEA and CFD optimisation techniques, together with the engineering knowledge of Wilde, the efficiency of the fluid performance was improved by over 25% while concerns over robustness were eliminated by changing the structural design and manufacturing process without significantly increasing weight. Forum Energy Technologies was formed in 2010 by the merging of Forum Oilfield Technologies, Triton Group, Subsea Services International, Global Flow Technologies and Allied Technology. Forum is a global oilfield products company providing services to the subsea, drilling, completion, production and infrastructure sectors of the oil and gas industry. The XT1500 subsea vehicle developed by Forum is used for the trenching and burying of rigid and flexible products and power cables up to 3m below the seabed. Jet trenching involves lowering jetting swords into the seabed to create a continuous fluidisation zone. An eductor at the rear of the vehicle removes the fluidised material and ejects it to the sides of the trench. This creates a continuous trench behind the vehicle, so that a stiff product (i.e. a rigid pipeline) will lie into the trench. To maintain the fluidisation generated by these main jets a backwash of low-pressure water injection is introduced into the trench from behind the main swords. This enables small, flexible products to be laid into the trench before the seabed compacts. A swivel manifold assembly on the jet arm enables the swords and nozzles constantly to point in the optimum direction when lowered into the maximum trenching depth. 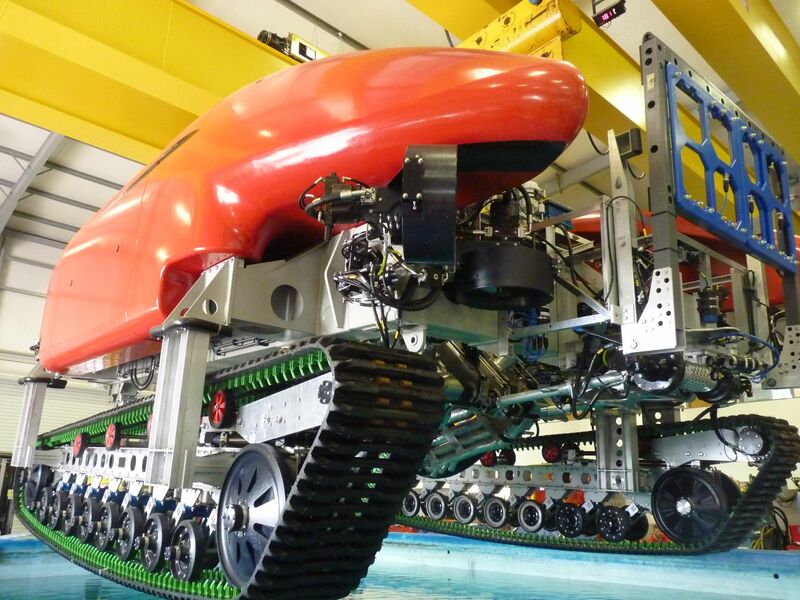 Forum was tasked with the design and construction of a new subsea vehicle based upon a smaller XT1200 vehicle currently in operation in the North Sea. A key objective for the new XT1500 vehicle was improving performance of the forward tooling assembly in order to more efficiently fluidise the seabed, guaranteeing the ability of any product to accurately lay into the trench. In order to achieve these objectives, structural mechanics and fluid dynamics technical specialists at Wilde worked together to first carry out an initial design assessment and then subsequently to evaluate potential design improvements. Computational Fluid Dynamics (CFD) methods were used to improve the internal flow characteristics and Finite Element Analysis (FEA) was then undertaken to assess the structural significance of any internal alterations. ANSYS software was used throughout the project as the Workbench user environment provides an ideal geometry editing, meshing and solving platform for both FEA and CFD. Within the design brief to Wilde a footprint was specified by Forum in which the manifold internals must be located, together with the location of the inlet and three outlets. 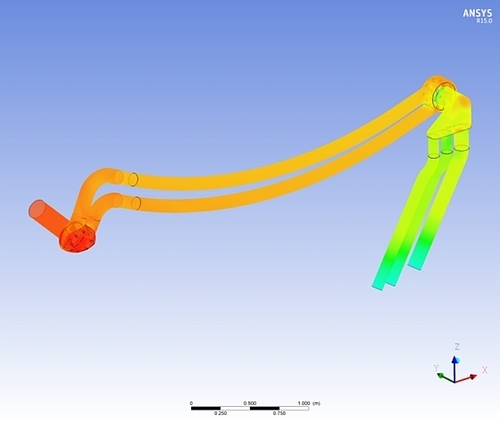 Each of the components downstream of the fluid pump, connected in series with the manifold, were first analysed using the Fluent solver within ANSYS and then characterised with a loss coefficient. This procedure ensured the correct flow distribution between outlets, enabling Wilde to efficiently concentrate on manifold design and locating the highest losses. Design improvements were then made by Wilde engineers to these regions in order to reduce losses across the system. The manifold was ‘fine-tuned’ by exploiting the optimisation capabilities of the ANSYS Fluent Adjoint Solver, using pressure loss as the target variable. By allowing the mesh to adapt, an optimised shape was produced for the internals of the manifold. Results obtained showed the new design would have an expected reduction in loss coefficient of approximately 26%. Both operational and survival cases were considered as part of the structural assessment. The initial analysis of the manifold indicated a weakness in the welded regions. Forum had already identified this area as a potential problem and FEA by Wilde reinforced their reasoning to move from a welded manifold to a machined manifold. The fluid dynamics design improvements identified through the CFD optimisation study were incorporated into the initial design of the new machined manifold. However, the decision to switch from a fabricated to machined component meant that there would be an inevitable increase in weight unless a process of optimising the structural characteristics of the design was undertaken as well. A significant weight increase would negatively affect the buoyancy and balance of the trencher and therefore had to be avoided. 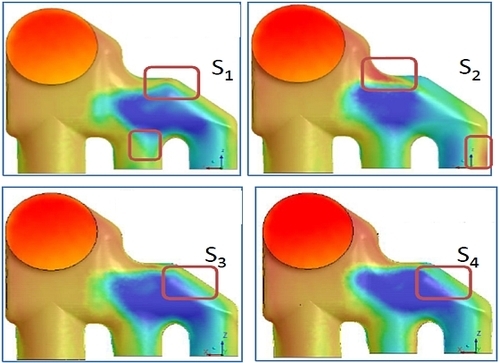 With the help of FEA, Wilde engineers were able to reduce the weight of the design to within acceptable limits while mitigating the risks of crack propagation within welded areas. 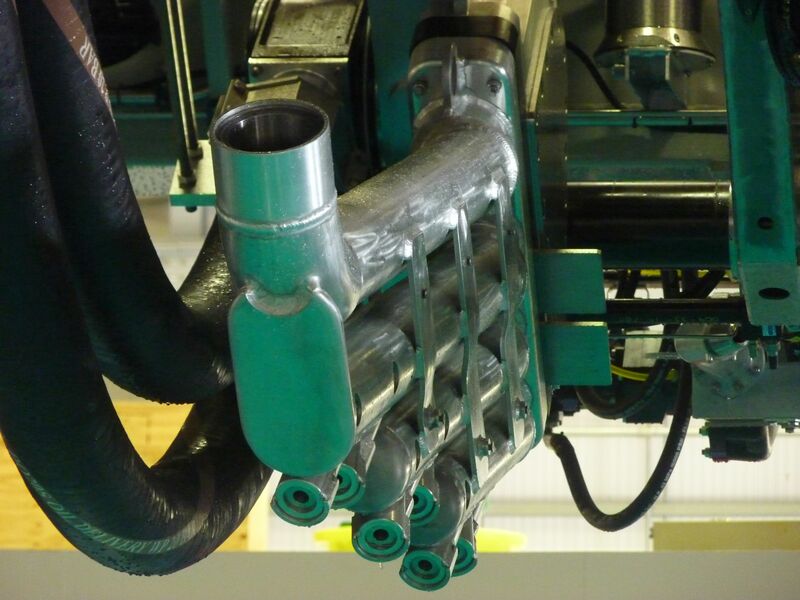 The FEA and CFD carried out by Wilde enabled Forum to improve the forward tooling assembly on their new trencher vehicle well in excess of what could have been achieved through more traditional engineering methods. The successful application of simulation and optimisation techniques, together with a close working relationship between the Forum and Wilde engineering teams, resulted in a vastly enhanced design. All initial objectives were satisfied and subsequent physical testing confirmed that operational performance had been significantly improved. This was a truly collaborative project, not just between Wilde & Forum, but also between Wilde’s own fluid & structural mechanics engineers – and their tools. Wilde’s engineers were placed on site at Forum & embedded in their design team. This gave Forum guaranteed full-time access to the skilled analysts they required & facilitated direct & immediate communication across the combined team, to the benefit of all. As well as enabling the team to deliver a demonstrably improved design within time and budget, secondment arrangements like this offer educational advantages to both parties: Wilde’s talented analysts were directly exposed to real-world operational & manufacturing constraints on design, whilst Forum was able to experience first-hand the benefits of advanced inter-operable simulation & optimisation tools in driving design. For more information on Forum Energy Technology, please visit their website.